Table function in R -table(), performs categorical tabulation of data with the variable and its frequency. Table() function is also helpful in creating Frequency tables with condition and cross tabulations. Main Objective of table function in R is creating Frequency table. Lets use iris data set to demonstrate our example. Lets create a frequency table for types of species in iris. We can also create a frequency table with predefined condition using R table() function.For example lets say we need to get how many obervations have Sepal.Length>5.0 in iris table. Which says there are 3 cars which has carb=1 and gear=3 and so on. Similar to 2 way cross table we can create a 3 way cross table in R with the help of table function. 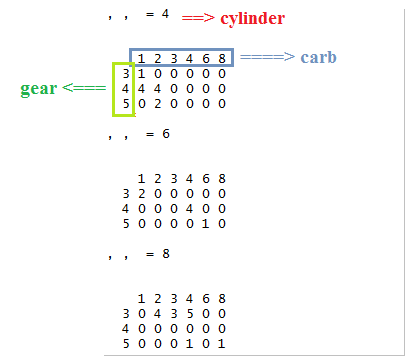 Indirectly it gives the cross tabulation of gear* carb for cyl=4,cyl=6 and cyl=8 separately as shown above.